Looking for the Best Video Poker Games? Check Out These Casinos! The Jacks or Better optimal strategy is your only chance to bring video poker's expected return of up to 99.54%. Check out the best strategy to win at Jacks or Better and get ready to crush video poker! Become a video poker pro with the only Jacks or Better strategy that works! In this article, I am going to show you how to maximize your winning chances at video poker withthe best Jacks or Better strategy. 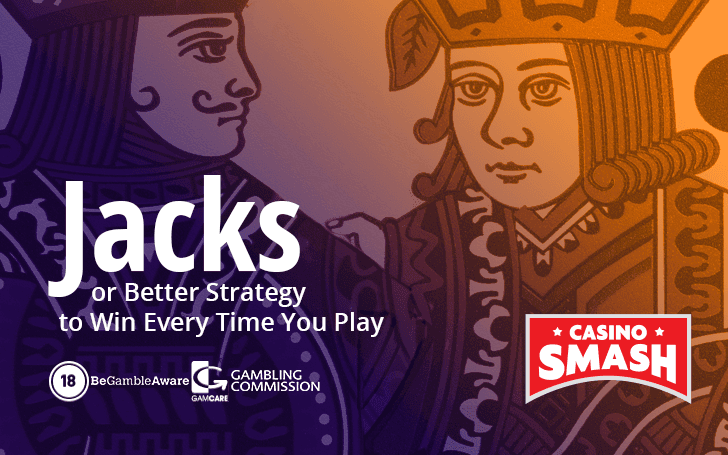 Check out all the strategy tips in this article and get ready to beat the Jacks or Better video poker! Video poker is one of the most exciting and entertaining games one can play at a casino and as a result is also one of the most popular. It also happens to be the game which offers players the best return out of all the casino games available. Perfect play, using the video poker optimal strategy, on a full pay game, can result in an expected return of up to 99.54%. Professional video poker players can show significant long-term profits once the benefits of frequent player rewards are calculated into the equation. In brick-and-mortar casino’s this is in the form of comps such as show tickets, accommodation food and drinks. In the online world, most operators offer frequent player rewards points that can be redeemed for cash and prizes. The first steps to becoming profitable when you play jacks or better video poker, are to check out the video poker rules and then understand the various hard strengths in poker. The idea is to end up with the best 5 card poker hand possible. Below is a list of hand strengths and their composition. 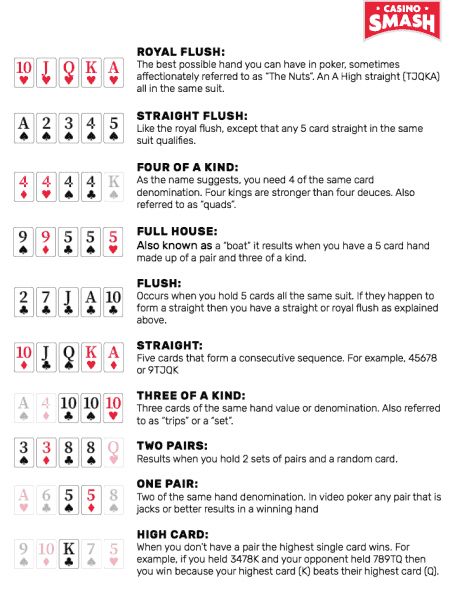 Royal Flush: The best possible hand you can have in poker, sometimes affectionately referred to as “The Nuts”. An A High straight (TJQKA) all in the same suit. Straight Flush: Like the royal flush, except that any 5 card straight in the same suit qualifies. Four of a Kind: As the name suggests, you need 4 of the same card denomination. Four kings are stronger than four deuces. Also referred to as “quads”. Full House: Also known as a “boat” it results when you have a 5 card hand made up of a pair and three of a kind. Flush: Occurs when you hold 5 cards all the same suit. If they happen to form a straight then you have a straight or royal flush as explained above. Three of a Kind: Three cards of the same hand value or denomination. Also referred to as “trips” or a “set”. Two Pairs: Results when you hold 2 sets of pairs and a random card. High Card: When you don’t have a pair the highest single card wins. For example, if you held 3478K and your opponent held 789TQ then you win because your highest card (K) beats their highest card (Q). To win long term, you should ensure that you are playing a game which is full pay. A quick way to check this is to make sure that when you have 2 pair you win 2 times the amount of your bet. Some operators have games in play which use a lower pay scale and playing those games should be avoided if you are serious about showing a profit. A winning video poker strategy is all about taking actions that have the best possible expected rate of return. The game of poker revolves around the probability of certain outcomes coming to fruition. Understanding the odds of these outcomes in various situations is how professional poker players gain an edge in the games they play in. Playing a Jacks or Better optimal strategy allows for no mistakes and demands the strictest level of discipline. The low pair is the most improvable hand you can be dealt in Jacks or Better video poker. How you play in these situations will determine, how close to optimal jacks or better video poker strategy you will land. Most of the time the decision to hold onto a low pair is obvious. There are times however where certain possibilities are available and players can make mistakes and this is what separates the winners from the losers. Below are some situations where, even though it is tempting to go for a big score, you should hold onto your pair and seek to build upon it. Dealt a low pair whilst having four to a straight you should always keep your pair. For example, if you are dealt 22345 you should discard 345 and draw 3 cards. Dealt a low pair whilst having three to a straight flush we want to keep our pair. For example, when you have 4s5s6s6hAd you need to keep your pair of sixes and draw 3 cards. Dealt a low pair while having 2 of the cards that could lead to a royal flush, optimal play dictates you keep the pair. For example, when you have 4h4s7cKdAd the play is to hold onto the two fours and abandon the chase for glory. Conversely there are situations where the math shows us that breaking a low pair is profitable over the long term and part of jacks or better optimal strategy. When dealt three to a royal flush and holding a low pair you should always embark on a journey along the path to glory by breaking your low pair. For example, if you have 3sJcJhQcKc you want to discard the 3s and Jh in search of the gold. When you have four to a flush along with a low pair the correct play is to go for the flush. If you hold 6h6d9hQhKh you should ditch the 6 of diamonds and look for a fifth heart. 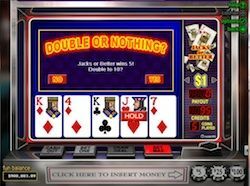 A pair of Jacks or Better in video poker constitutes a winning hand where you are guaranteed your money back. Most tutorials advise that you should never break a high pair and for the most part they are correct. Below are some situations where you may be tempted to break a pair of jacks or better, in search of a bigger win, however optimal strategy demands a disciplined approach of holding onto what you already have. When you have four to a flush that includes a pair of jacks or better you should always keep the high pair and discard the other 3 cards. Note that in the same situation with a low pair you would go for the flush. The reason for this is that the high pair is already a winning hand whereas the low pair is not, changing the maths considerably in your favour. Holding a high pair whilst also having four to a straight is another spot where holding onto your high pair is the correct play. 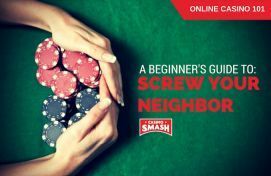 The odds on you hitting the straight are not high enough to warrant foregoing a winning hand, that still has the possibility to improve. When you are dealt a hand containing three to a royal flush including a high pair it is certainly temping to go for the royal. In this case however it pays to hold onto your pair. For example, 3hTsJsQhQs looks great and has a ton of potential, however the disciplined move is to keep your pair of ladies. Three to a straight flush whilst holding a high pair also looks great, however holding your pair is going to pay dividends over the long term. A hand like 4d9hJhQdQh should again result in you holding onto those ladies. 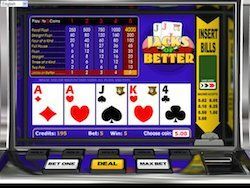 There is one situation where Jacks or Better video poker optimal strategy actually indicates that players should break a high pair. When you hold a high pair with four to a royal flush you should break the pair and look to hit the 1 card that will pay off huge. When most players are dealt a winning pat hand such as a straight, full house or any form or flush they hold all your cards and take the win. This is correct for the most part, however you will leave some edge on the table unless you make the following adjustments. Although this may seem crazy, it happens to be backed up by solid math around the probability of certain outcomes occurring. When dealt a pat flush such as 59TJQK we also have what is called four to a royal. In this situation the correct play is to discard the 5 and go for the royal flush. When dealt a pat straight that is also four to a royal such a TsJsQhKsAs, we should discard the Qh and go for the royal. The payoff when we hit the Qs is worth it. Playing Jacks or Better video poker in an optimal way maximises your expected return as a player. It takes extensive practice to understand each situation and the relevant action necessary to ply perfectly. You should employ the use of a jacks or better strategy trainer to test yourself and practice your play. The more efficient you get in making these decisions to faster you will start to play at an optimal level. The main concept behind playing video poker profitably is discipline. The math is clear around the probabilities involved with certain outcomes and all that is left is for you to make decisions on your actions based upon those probabilities. Using the statistics are a basis for your decisions removes a lot of the psychology involved with gambling. 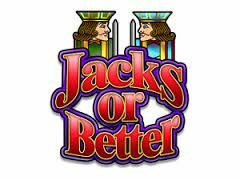 Jacks or better video poker is a game where if you play according to the optimal strategies set out using those statistics, you will not only enjoy yourself, but likely end up ahead at the end of the day.